So it’s with great irony that I’m inspired to write this post by the fact that one of my coworkers can depersonify herself in favor of felinicizing. Mind you, this is not some nutcase or twitchy affliction, this is an active choice to do cat impressions. And they’re not just cat impressions, she becomes a cat, which requires very little interpretation to anyone who has ever owned a cat, or perhaps even only seen a cat, or watched internet videos about cats, or seen pictures of fruit helmeted cats on the vast ARPAnet. And this Catsy, as we shall call her, is an otherwise well-adjusted, sociable, fun adult with a great sense of humor; she’s no cat lady. Within just the last few days, I’ve seen her do cat-napping, cat-about-to-hairball, cat-seeking-attention, cat-batting-both-paws, and the best human-cat impression I’ve ever seen: cat-about-to-puke. I don’t recall the conversation that led to the cat-pre-puke maneuver, but it was met with an instant roar of approving laughter, which encouraged a second round of the masterstroke impression. Most people who know me these days know me as a no-pet kind of guy, but it wasn’t always that way. We had two cats up until 2006, the year that Aly was born. Allow me to introduce Sasser, the blue-gray cat on the right. Sasser is short for Sasquatch because he was one of those cats with extra toes; 7 toes on each back foot and 6 on each front foot. Sasser was your typical scaredy cat, equally masterful at hiding with only his body sticking out from beneath the couch or disappearing into a hole in the cover under a box spring. 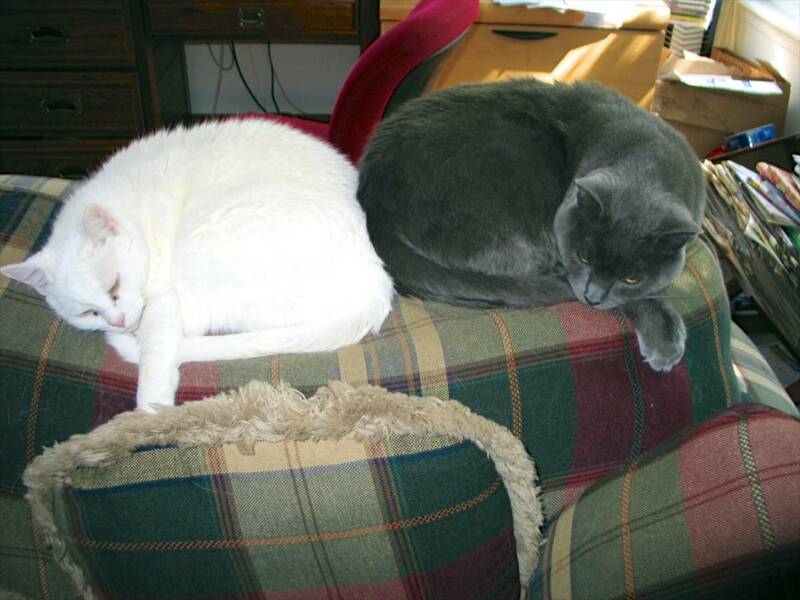 The white cat on the left is Rambi, named after the more-awesome-than-reality rhino from the Donkey Kong Country games. Rambi was your typical can’t-shut-my-cat-trap crazy meowing white shedding machine, except in the places where she’d rubbed against the wall so much that she’d yellowed. This cat was a prodigious throw upper, having decorated many places within our house with cat food that had barely been swallowed, let alone digested. I could never quite understand this whole “eat as fast as you can so you can throw up as fast as you can” thing that Rambi practiced, but I’m at least comforted by the fact that others have suffered with cats as well. After witnessing Catsy’s impression of verge of puke cat, and recovering from the pain of the ensuing laughter, I mentioned that I used to hate when Rambi would pull the “I’m going to run right to the middle of the carpet, stop short, then begin the body shuddering hurling” crap. I then mentioned that I would try to head this off when I saw it coming, usually by chasing the cat so at least the chunkage would end up on hardwood or linoleum. The four other people in the conversation, all current or former cat owners, each mentioned that they had similar tricks to try heading off the carpet-stinking cat hurl. There was another chaser, then a catcher who tries to use a magazine to divert the carpet-bound hurl, and another who simply picks up the cat and puts it down in a different spot, whereupon the cat decides it no longer has to puke. I regret having never tried this maneuver during my tenure as a cat owner, though it strikes me as moving the pet owner dangerously close to the line of fire. Brave man you are, Mr Lift and Replace.